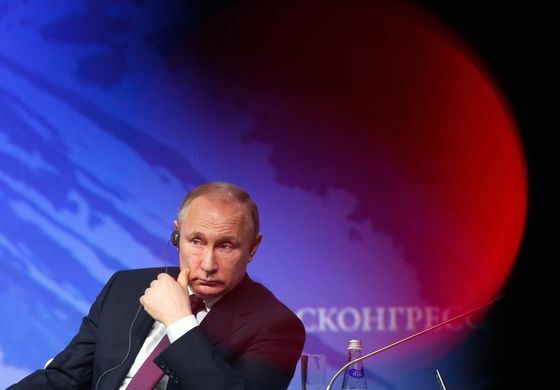 (Bloomberg) -- President Vladimir Putin kept his options open on whether to extend Russia’s joint oil-production cuts with OPEC beyond June, saying he wanted to continue cooperation with the group but also highlighting the many uncertainties in the market. Russia is comfortable with current oil prices, which rose to a four-month high above $70 a barrel in London on Monday, Putin said at the International Arctic Forum in St. Petersburg on Tuesday. The president also said he doesn’t support an “uncontrollable” increase in the cost of crude that could hurt his country’s other industries. “We’ll coordinate with OPEC and take a decision depending on the market situation,” at the next meeting in June, Putin said. “Of course, we are closely monitoring the market together with our partners, first of all, with the main oil producers, Saudi Arabia and countries of the Persian Gulf,” Putin said. U.S. sanctions have eliminated a significant volume of oil exports from Venezuela and Iran, helping drive up the price of international benchmark Brent crude by more than 30 percent this year. Meanwhile, Libya’s output has been frequently disrupted as armed factions battle for political supremacy. The Russian president also highlighted the possibility that any of those countries could become a bearish influence on prices. If the U.S. were to seize Venezuelan crude and sell it on the global market, or decide to loosen sanctions on Iran to foster a political compromise, inventories could start to increase again, Putin said. The situation in Libya could also normalize, allowing the country to boost exports, he said. Russia will also take into account its domestic oil companies’ plans while deciding on the future of the OPEC+ deal, Putin said. “We understand that output shouldn’t stop, investment should come into the sector, otherwise that also may create problems both for us and global energy,” Putin said.